So you’re thinking your ceiling needs a new coat of paint? The first thing you need to is decide if you are going to paint the walls also, or just the ceiling. If you are going to paint the walls, make sure you paint the ceiling first, that way you don’t have to worry about the ceiling dripping paint on finished walls. Once you’ve got your painting plan figured out, you need to pick out your paint. Measure the rooms height, width, and depth. Give this information to the company you decide to buy your paint from and they will assist you in determining how much paint you’re going to need to get the job done. As always, having a little extra is always a good thing in-case you need to do touch ups later. The next step is to remove the furniture from the room, however if you live in a place where this isn’t possible move all the furniture to center the room and cover it well with a tarp or plastic. Next, cover the floor with plastic and make sure you tape it down to prevent paint getting under the plastic onto the floor. Now you’re prepped, but there is one more thing to sort out before you decide what you’ll be doing your painting with, and that is do you need primer? The rule is that if you intend to paint over a color that is darker than the hue you’ve selected definitely put on a primer. This will make it so the new shade won’t be bled through by the old color. It will also save you time and money to put up a primer before the finishing paint because the new color will require less coats of paint. Follow the next steps with the primer as you would with the finishing paint. Make sure you let the primer dry 24 hours before you begin painting. Next step is to cut the ceiling, which means to paint the edges of the ceiling to minimize the amount of paint that gets on the walls. Buy or rent a paint sprayer and spray the ceiling. It’s a bit of a mess but it gets the job done, just remember if you do this, take plastic over the windows and anything you don’t want to color as a fine mist will cover everything. Easy to paint over the walls, but not as easy to get off of glass. Or use a roller to paint instead of the sprayer. If you decide to roll the ceiling you can either use a ladder to get up their comfortably or use an extension pole for your roller. 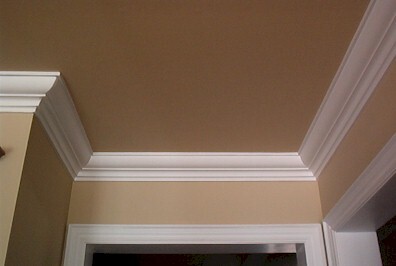 Then paint the ceiling in even strokes to make sure you keep an even thickness across the area. After you paint your ceiling, if the walls are you next step, go for it. Just make sure the ceiling is dry before you get started.If the ceiling was the only part of the room you painted, the last thing you need to do of course, is clean the room up, put the furniture back in place, and enjoy your new space.